Most likely, we promote one of our underpaid assistants to be our underpaid head coach. This gives us the best chance of maintaining our current staff. A coach from outside the family would likely want to bring in some of his own staff. For my two cents worth, I wouldn't want anyone who has never been anywhere but Wofford. I prefer someone with a Wofford heritage who has experience outside. They all know Wofford staff is underpaid, and they will either want to pursue it or not. No one is expecting to come to Wofford for the bucks. This is will be a crucial hire for Wofford going forward. We have a solid foundation to build upon. We have upgraded numerous athletic, academic, and social facilities around campus. Its hard to put upgrade and Coach Ayers in the same sentence, but the next coaching hire should be someone who can help us get to the next level of Elite FCS football. Would love to have someone with experience in competing on a National level (CAA , MVFC, or mid major). With that being said if we want to compete with next level competition we better bring our check books with us. I hear you Boulder but if Lesesne and Morrison used that same criteria, Ayers would have never been hired in ‘88. Maybe now is a different scenario but I would hope all options are on the table, Wofford and non-Wofford. Personally I would love to see a Wofford guy get the job but to me what is is most important is continuing and building on the culture Ayers has established at Wofford: TOUGH, disciplined, smart, aggressive, gritty, unselfish, defense first teams which run an offensive scheme we can effectively recruit to and succeed with (IMO some form of the option) with players who meet our high academic standards with high character. Wins and losses will take care of themselves. as a Furman fan, I wanted to come here and say I respected Ayers. Seems to have been a great guy. Hope you guys get a good one to keep the SoCon strong..
To reiterate; I just think some experience outside of Wofford gives an insight as to what we coach against. I think we have to have someone who understands the culture of Wofford, as it might overwhelm most coaches who have never had to deal with our small school, academics first attitude. I have noticed somewhat an absence of Nate Woody's name. Even though he is getting paid more at Appie, I felt he went away to get experience and be more attractive to Wofford if and when the opportunity came. As we have discussed on this site before, there has been a hyperinflation in the coaching world in the past 5 or so years, and there are assistant coaches making more than our entire coaching budget. The FCS world is far different from the Big 5 these days, and few will have the luxury of a long term top notch coach at FCS prices. You have to love the school, city and culture more than the perks of big time football and a big time ego. I believe a "family" hire is a must, but I agree that it should be someone with some experience beyond Wofford. There's simply too much to be learned from how others do things to get someone that is strictly from within the Wofford bubble. I'm not in favor of an outside the family hire this time, but if the next coach either doesn't work out or leaves after a few years then it might be time for some new blood. If it was a few years further down the road then possibly Coach Wood might be the guy, but I think that's a little premature. Coach Nash has been here longer and would probably be the safer pick from the current staff. I think elevating Coach Lang permanently would just be a short term solution and ultimately end up hurting the program more than it really helps it. From those with Wofford ties, I think Woody's time may have passed and Fuqua might be a more likely choice. Like Wood, I'd feel better about Fuqua if he had a few more years of outside influence, but those aren't the cards on the table. I doubt Wofford goes outside the family, but I'm not sure where they'd go. Chadwell was mentioned, but he's probably going to be the long term solution at Coastal so that probably takes him out. Someone from the academies or even Georgia Tech's staff is a possibility. I don't know enough about who is successful in D-II to throw out a name. 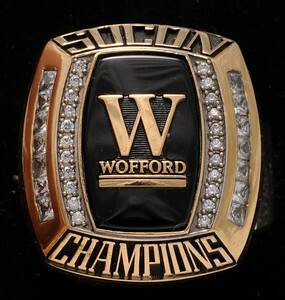 There aren't many "do more with less" programs in FCS winning as consistently as Wofford has been so that isn't easy. Broadway at North Carolina A&T is solid, but that's a pass first offense. I expect Richard Johnson to form a committee, hopefully Coach Ayers is at least somewhat engaged in that, and they can put some feelers out to see who's interested and then add those names to those we have within the Wofford family. This would be a great time to leverage other relationships we have such as Coach DeBerry, Danny Morrison and possibly even Jerry Richardson. I would include Mike Young as well since he knows the place and knows what it takes to be successful in our environment. Wofford has a viable opportunity to offer. That opportunity is not without it's unique challenges, but it is a job with some advantages (not high pressure, supportive administration, good facilities, winning program in place, competitive conference affiliation, etc.). This is uncharted territory for Wofford and it will be interesting to see how things shake out. Lastly, if anyone doubts the impact that Coach Ayers has had, a story about his retirement is currently linked among the top headlines on ESPN's college football page. This is a legitimate story within college football and that is only the case because the man and the football coach he has been for so long. Major sign of respect. The biggest story about Coach Ayers retirement and his work at Wofford should be that not only did he win, but also that he did it right. That our athletes HAVE to be students and perform in the classroom with character IS the story, IMO. There are plenty of coaches who find a way to win, but how many of them would we want to coach our sons? I imagine Wendy Nix, Wofford grad @ ESPN, probably had something to do with that but it definitely is a sign of respect. Just want to note that Woody and Lang are the same age... Anyone know if they are even interested? Ruckus? I would think that staying in the tree, but outside Wofford as of now, you would think Fuqua... Service Academies were brought up... Heres one... Ashley Ingram, Run Game Coordinator at Navy... Georgia native... Recruits parts of the south for Navy... Just a thought, not saying we need to go that direction. WoCo65 wrote: I imagine Wendy Nix, Wofford grad @ ESPN, probably had something to do with that but it definitely is a sign of respect. I wouldn't rule that out. Wendi was a classmate of mine at Wofford and is a Terrier through and through. But, I think the people that know what's going on in college football recognize Coach Ayers' achievements and even though we may not get headlines routinely, this definitely warrants a mention to the larger world of college football. SmallTownTerrier wrote: Just want to note that Woody and Lang are the same age... Anyone know if they are even interested? Ruckus? I would think that staying in the tree, but outside Wofford as of now, you would think Fuqua... Service Academies were brought up... Heres one... Ashley Ingram, Run Game Coordinator at Navy... Georgia native... Recruits parts of the south for Navy... Just a thought, not saying we need to go that direction. I have heard that Lang is not interested in being head coach. I can confirm that WL has no interest in being head coach. Considering our success, especially recently, wouldn't everyone agree that retaining as much of the present staff as possible should be a priority? In that case, I think that our best options are Woody, Fuqua, and Nash. As some have pointed out, Woody would have no financial incentive to return, only sentimentality. That leaves Fuqua and Nash. I would like to see one or the other of them offered the job within a week, then let's press on without losing any momentum.